With the new Azure SQL Database tier structure, it seems important to monitor your database "DTU" usage to know whether to upgrade or downgrade to another tier. 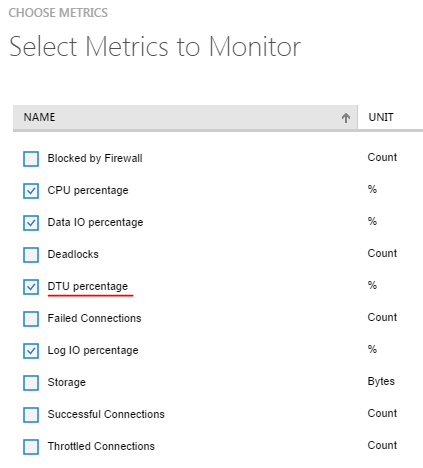 When reading Azure SQL Database Service Tiers and Performance Levels, it only talks about monitoring with CPU, Data and Log percentage usage. I can't find any about this online. Is this essentially a summary of the other DTU-related metrics? A DTU is a unit of measure for the performance of a service tier and is a summary of several database characteristics. Each service tier has a certain number of DTUs assigned to it as an easy way to compare the performance level of one tier versus another. Database Throughput Unit (DTU): DTUs provide a way to describe the relative capacity of a performance level of Basic, Standard, and Premium databases. DTUs are based on a blended measure of CPU, memory, reads, and writes. As DTUs increase, the power offered by the performance level increases. For example, a performance level with 5 DTUs has five times more power than a performance level with 1 DTU. A maximum DTU quota applies to each server. The DTU Quota applies to the server, not the individual databases and each server has a maximum of 1600 DTUs. The DTU% is the percentage of units your particular database is using and it seems that this number can go over 100% of the DTU rating of the service tier (I assume to the limit of the server). This percentage number is designed to help you choose the appropriate service tier. For example, if your DTU consumption shows a value of 80%, it indicates it is consuming DTU at the rate of 80% of the limit an S2 database would have. If you see values greater than 100% in this view it means that you need a performance tier larger than S2. As an example, let’s say you see a percentage value of 300%. This tells you that you are using three times more resources than would be available in an S2. To determine a reasonable starting size, compare the DTUs available in an S2 (50 DTUs) with the next higher sizes (P1 = 100 DTUs, or 200% of S2, P2 = 200 DTUs or 400% of S2). Because you are at 300% of S2 you would want to start with a P2 and re-test. Still not cool enough to comment, but regarding @vladislav's comment the original article was fairly old. Here is an update document regarding DTU's, which would help answer the OP's question. Not the answer you're looking for? Browse other questions tagged azure azure-sql-database azure-storage azure-monitoring or ask your own question. Are all available DTU used to exec a query? Long Azure SQL database import, 100% DTU - will changing tier for period of restore helps? How can I configure metric alerts for a SQL Azure Database?